Autograph Alert seems to have turned into this great Ozzy Osbourne LP title. Autograph Alert which started as the brain child of Todd Mueller and Stephen Koschal to attack third party authenticators who were failing their items on Ebay and in auctions has now turned to “BS journalism (and I used that term lightly) with an agenda”. Months ago when they first attacked me they said that usually they didn’t waste their time on little guys like me. I guess I’m not as little in the business as they said as they attack me like all the other good dealers quite a lot. They state things in their blog without using or showing any facts. We call that Koschalism. They use what’s called an ellipse quite often to take quotes and statements out of context. An ellipse is when they use …then the part of the quote they want then use… again. What this was meant for in journalism is to cut out the parts not relevant to the story and just get to the important part. Here in this report I am going to use their last attack on me (which reads like a child wrote it) and fill in the missing pieces of the story. I will also point out lies that are just figments of his imagination with no proof to back them up. When I write I back things up with illustrations or copies of emails in full to show they are not doctored in any way. This will be quite entertaining and will show how low someone would stoop to protect the crooks in the autograph business by bashing the good people in the business, enjoy! These are the opening words from the fabulous song "Somebody to Love" by the “Queen of Rock & Roll,” Grace Slick. These can also be the words of every autograph collector who has purchased a signature of a rock & roll celebrity that came with a COA from some self proclaimed autograph authenticator. Since the purchase, you probably discovered that your item is not genuine. I am not a self proclaimed expert. I am a considered an expert by my peers in the industry. 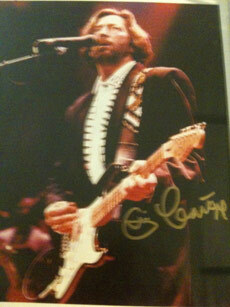 I have a 20 year proven track record of being the best expert in the autograph field of music autographs. This is why I am able to testify in court as being an expert in my field. Yes, the joy within you can die and you may no longer want to collect autographs. More discouraging is when you obtained your autograph “in person” and was foolish enough to spend money to have some high profile authenticator look at it and declare your item is not genuine. This happens very often, especially with some of the incompetent authenticators used by eBay. EBay US no longer uses authenticators to pull items. This practice was stopped 8 months ago due to legal issues in the States. EBay Europe does allow this and has made some mistakes in my opinion. Many new collectors have left the autograph hobby strictly due to the mis-authenticated autographs they had purchased. The uneducated collectors trusted the “guesses” from the opinionators working for the so called autograph authenticating companies. You must be talking about these Galleries that sell countless forgeries in upscale places that Autograph Alert defends on a regular basis. Remember the name Frank Caiazzo? A handful of auction houses promoted this guy as a authenticator of Beatles autographs. Don’t hear much about him anymore since his last problem regarding one of his opinions. The other individual being promoted, by just a few, as an authenticator of music, is Roger Epperson. We have in our files a lengthy email from a noted autograph dealer about a conversation he had with Epperson’s competitor Frank Caiazzo. Caiazzo said some very unbelievable things about his knowledge of Epperson’s dealings with someone referred to as Mr. Clean. (In an email from Epperson dated May 23, 2009, Epperson refers to Joe Long, known as Mr. Clean, a forger.) The details are incredible and will not be made public on this site. We’ll let Caiazzo and Epperson sort this one out! Let’s chat a moment about Joe Long. (I have never heard of him called as “Mr. Clean” until 3 or 4 months ago) Joe was one of the originators of selling rock and roll autographs. 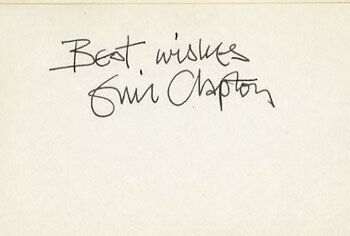 When I started in 1990 he was pretty much the very few who did music autographs. Joe would buy lots of real stuff and mix in some of the bad stuff with his good stuff. Above is an example of a page in his catalog from 1993. 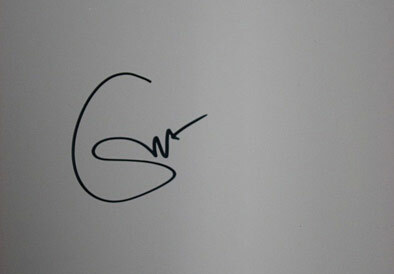 Two of the three Beatles autographs are authentic and one is not. (The first person to email me which one is the forgery gets a signed Ringo Starr CD cover) He sold a lot of great stuff in his day. So saying that he sold only forgeries again is an out and out lie. Just like almost everything that gets written in Autograph Alert. He soon went away after Frank convinced me a few others of what he was doing. 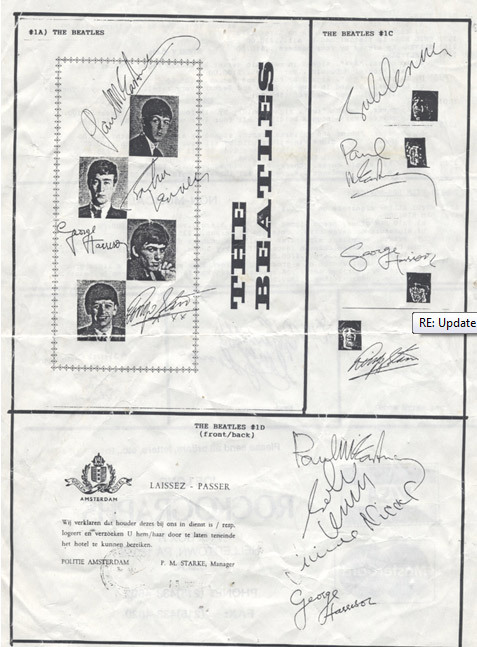 Frank is one of the best authorities on Beatles autographs. We have emailed Mr. Epperson regarding his relationship with Mr. Clean and asked him approximately how many items he has purchased from Mr. Clean in the past. Mr. Epperson refuses to respond to this question! Why would I respond? You would just twist the truth like you always do and try to make me look bad. 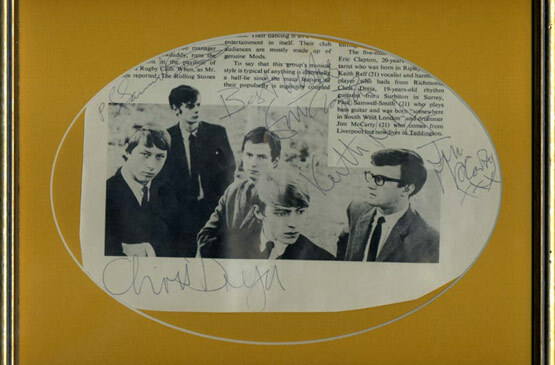 For many years, non genuine rock & roll autographs have been appearing in auctions. One of the reasons is usually the owner/consignor knows or feels the signature on an album is not genuine and does not want to try and sell it under their name. They let the auction house put their name to it. A handful of auction houses feel the same and will use these incompetent authenticating companies to authenticate the item. This way the auction house bears little or no responsibility. They can all blame the authenticator when the item is eventually found to be not genuine. Some of the auction houses who played this game are no longer in business. Can anyone make sense out of this paragraph? How many times we have seen the same rock and roll autograph once declared genuine fail years later by the same authenticating company. In many cases it’s not the autograph that’s being authenticated but who is submitting the item. This is what can determine if the item is going to pass or not. I give up, how many? You must have the list with exemplars of these or do you? Of course I’m not going to work for anyone forever. I am a human being. I will retire one day. So now Cori Raiderman Broswavic is a collector? I’m sorry but he is a dealer and sells his autographs on Ebay. I think we all remember my stories on this guy. Please re-think what and who you defend. That was a “tongue in cheek” comment you idiot. Tell the whole story. He was paid before the letter was received by them. He was a customer of mine for years. This was the straw that broke the camel's back. The IACC/DA was holding shows around the United States for several years. Roger Epperson had a booth at almost every show but often the show promoters received complaints about the items Epperson was selling. 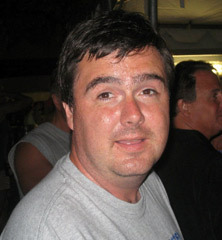 On May 6, 2002, Epperson was sent a letter notifying him about the complaints during the last several shows and that he would not be able to have his regular booth at the next show which would be held in Ft. Lauderdale, Florida, on November 23, unless his autographs were vetted by a professional. Epperson did not respond, therefore he was not allowed to do the show or any others in the future. This is a total 100% lie. No letter was ever sent nor was I a member of this organization in May of 2002. Sounds like I’m a pretty sharp business man here. If someone sells me a forgery I don’t do business with them anymore. Remember too this was in 1994. Even then I was pretty sharp in the way that I did business. Interesting is that Epperson admits buying from forgers but it always seems that he claims to be lucky stating he didn’t buy much. I was more of an in person seller back then. This was in 1991-92. He bought from me. 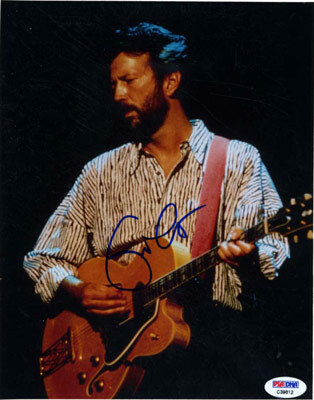 I may have bought a Joplin autograph off him in 1989. How much can anyone believe what Roger Epperson says? Remember in the paragraph above Epperson states he bought very few items of him (Linehan). Not two months later, Roger Epperson was again asked if he ever purchased items from Bill Lineman (forger). Epperson responded in his email of Sept. 15, 2009: “Did I buy from Bill? No.” Roger Epperson just got caught in a lie! Who are you to talk about parenting skills? You never even paid child support nor have seen your children in over 20 years. My child support is paid in full to my son. Again a lie. This was part of an email sent to Todd Mueller about the same guy Danny spoken about above. Todd said that I told Danny that he had said Danny was a forger. I don’t remember that as it was well over 10 years ago. So this is not about hanging with “another forger”. We try to avoid at all costs getting into personal lives but Roger Epperson has recently been attacking some industry icons on a personal level on his website. For him to spread stories about someone’s 21+ year marriage while Epperson’s own marriage lasted only four years tells you a little about Epperson’s personality. First of all I was married for 6 years to my ex wife and we were together 9 years before that. Please get your stories straight and quit lying. You try at all costs not to get into my personal life? Did you say some doctor you made up said I was dangerous or was that a lie too? Next I never have said anything about your marriage just the fact that you didn’t pay your child support for YOUR children. Epperson has admitted in emails that he has cancer and has had many radiation treatments. This may be one of the reasons for all his mistakes authenticating autographs. What can’t be explained is his claim to support Pez Candies and Vlasic pickles on his website. What!?! This is a spoof on your site you goof! Hypocrisy, do you even know what that big word means? Roger Epperson must feel he is better that others who sell autographs. He certainly holds some sort of disdane for only some of those who sell “rapists, murdering autographs.” Epperson says in his email of Sept. 16, 2009: “…no dealer I would call well respected ever sold such filth….” Epperson was referring to a dealer who sold some autographs of John Wayne Gacy. We checked our files and the following are just some of the dealers who have sold items by John Wayne Gacy. Mark Allen Baker, editor and publisher of the UACC’s Pen & Quill is presently selling a collection of bad guys including Gacy, Berkowitz, Dahmer, the Menendez brothers and much more. Others who have handled Gacy items are Leland’s Auctions, Gallery of History, Lone Star Autographs, Walter Burks Autographs, Stephen Koschal, History Makers, JFF Company, Todd Mueller Autographs, Remember When Auctions, RR Auctions and many more. Doesn’t Epperson work for RR Auctions? I’m sure RR Auction is pleased to know that Epperson doesn’t respect them. If this is what Epperson thinks of those who sell Gacy signed items what does he think of those who sell Lee Harvey Oswald or Hitler signed items? www.autographalert.com checked its files and found many dealers who have handled Oswald or Hitler items. They include Charles Hamilton, Alexander Autographs, Robert Batchelder, Nates Autographs, Remember When Auctions, Paul Hartunian Autographs, RR Auctions, The History Buff, Lone Star Autographs, Mastonet, Gary Hendershott, Signature House, EAC Gallery, Gallery of History, Profiles in History, Smythe Auctions, Christies Auction House and so many more. Interesting Epperson stated: “..no dealer I would call well respected ever sold such filth.” Who else but a dummkopf could make such a statement? Not only is Epperson’s statement stating some of the above are not well respected, in his opinion, a handful of them use Epperson for his “guesses” and or “opinions.” Very, very embarrassing! Embarrassing to whom? Not me. Epperson continues to rant and states he only sells rock and roll. Many of the rock and roll celebrity autographs he sells are drug addicts, outlaws, many are associated with crime, attempted murderers and some have committed suicide even by hanging. Some of the autographs he sells are Pete Doherty who is now an artist and will sign his artwork using his own blood, Jimi Hendrix, Janis Joplin, P. Diddy, David Bowie, Johnny Cash, Keith Richards,, Jim Morrison, Ozzy Ozborne, Kurt Cobain, Corey ‘C-Murder’ Miler, Richard Manuel, Lead Belly, Nichole Ritchie, Amy Winehouse, Vince Neal, Simon LeBon, Steven Tyler, Britney Spears, Elvis Presley and Michael Jackson. Is it possible that Roger Epperson, based on what he sells, doesn’t even respect himself? Are you freaking kidding me? You are comparing Jimi Hendrix and all of these stars (I don’t sell P Diddy, Corey C Murder nor Nichole Ritchie (who I think is an actress) to Jeffery Dahmer and John Wayne Gacy? Britney Spears and Elvis compared to Hitler. Dude you have lost your mind! I will be forwarding this to each of their publicists. I’m sure they will love to see this. Ohh I sell outlaw rockers autographs!! What a crock. Mr. Epperson claims he is an expert with the signatures of bob Dylan. 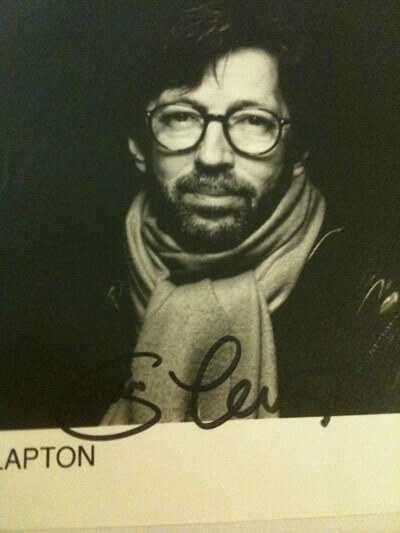 Lately, Mr. Epperson has been whining about a Bob Dylan signed portrait he purchased from a reputable dealer in 1993. 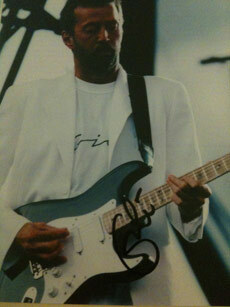 Epperson who claims he only deals in music and is a Dylan expert purchased this signed photo. He held this photo in his personal collection for 16 years and now because he dislikes the dealer who sold it to him, Epperson is claiming the Dylan is “an obvious forgery.” Epperson will not say who stated the item is a forgery and he has been asked this on three different occasions. As expected, no response from Epperson. Interesting, Mr. Epperson has recently emailed a music collector stating: “I will not authenticate any Bob Dylan material from after 1985...his signature has become far too inconsistent….” This does make Epperson look foolish as he purchased the above which was signed in the early 1990’s. In addition, Epperson was reminded that when he purchased the photo, it came with a lengthy detailed handwritten letter from an extremely well known “in person” collector who lives in Brooklyn. The letter explained in detail the time and place when Dylan signed the portrait. Mr. Epperson can’t recall the letter, maybe too many radiation treatments ago. The Dylan in question was purchased from you, Stephen Koschal. In 1993 when I bought this I was far from an expert. I trusted you and you failed me. I don’t collect autographs so this was not in my collection as I don’t have one. This was returned to me by a customer I sold it to many years back. Of course I refunded him but you would not refund me. It’s not authentic! You now even admit that I got it from you which you denied earlier. Get your stories straight! Not long ago we got another complaint from a female collector who contacted us who works for a charity auction. She stated: “we only get our signatures face to face.” She continues: “I recently had a gentleman win an item we provided to an auction that was signed by U2. I know it was good because we were face to face with the band. This guy Roger Epperson was asked by the winner of the item to authenticate it and Epperson stated it was not real.” The pattern continues of Epperson apparently being unable to authenticate autographs accurately that were obtained in person. People tell me this all the time. I call them as I see them. Again, I call them like I see them. I don’t have to sell anything to anyone I don’t like. Sports and modern entertainment autographs at one time were the fields of collecting to be cautious. With modern music selling for high prices, collectors are walking through a minefield of fake autographs authenticated as genuine by so called autograph authenticators. In some cases, depending on who you are and how much business you give the authenticator, paying for their opinion can also control the outcome of the opinion. Are too stupid to not know this too was tongue in cheek? Your site is a joke at best. I could learn more about autographs from reading the bathroom wall then I could reading you blog or your silly on line course. www.autographalert.com recommends collectors who want to purchase autographed items in the field of rock and roll to only purchase from a reputable dealer. It is most important to understand their rules for return. Also recommended are those auction houses who do their own authentication They do not rely on outsiders and stand behind what they offer. I hope this has helped any reader who may have thought that Autograph Alert had even a slight bit of integrity that they don’t. I hope soon that this will all come to an end and the good and honest dealers will stop being harassed by the crooks in the industry. Blair was one of the best and smartest “in person” collectors there ever was. I was lucky enough to have known him about 16 years and we learned a lot from each other about collecting autographs. He was always on the chase. He would plan vacations around bands touring in other countries. He traveled everywhere imaginable. My father even has a Detroit Pistons World Championship team autograph page that I got from Blair many years back. He will be missed by many who knew him. Rest in peace my friend. The autograph world has lost a dealer and friend this past weekend. On May 1, 2010 John Herbert made his transition. He and his wife Shirley have been friends of mine and with many others in the autograph community for many years. I have known them for at least 20. Here is the post regarding John’s passing. My prayers are with him and the family. John Henry Herbert went peacefully to be with his Lord and Savior on May 1, 2010. He was born in Franklin, Louisiana on November 9, 1932 to the late William F. Herbert, Sr. and Elizabeth O'Niell Herbert. John retired as a senior geophyicist from Tenneco Oil Company in 1988. He then began to pursue his love of history and archeology on a full-time basis. He enjoyed many travels around the world, among which a trip to the Holy Lands was a great highlight. All who knew him enjoyed his great sense of humor, sense of adventure, curiosity and generosity. John was an active member of First United Methodist Church, Houston. He loved the Lord and enjoyed serving Him. John was a U.S. Army veteran. John is survived by his loving wife of 54 years, Shirley; daughter Dianne Harris and husband William; daughter Elizabeth Ahearn and husband John; son John C. Herbert and wife Hisayo; grandchildren Richard and Nelson Harris, Ryan and Erin Ahearn, Kai and Mai Herbert; sister Patricia Howard, brother William F. Herbert, Jr., his wife Charlene; and numerous nieces, nephews and cousins. Visitation will be from 6:00 p.m. to 8:00 p.m., Tuesday, May 4, 2010 at Earthman Bellaire Funeral Home, 6700 Ferris. A celebration of John's life will be held at 2:00 p.m., Wednesday, May 5, 2010 at First United Methodist Church, 1320 Main Street, Houston, TX 77002. Those wishing to make a memorial donation may do so to First United Methodist Church. 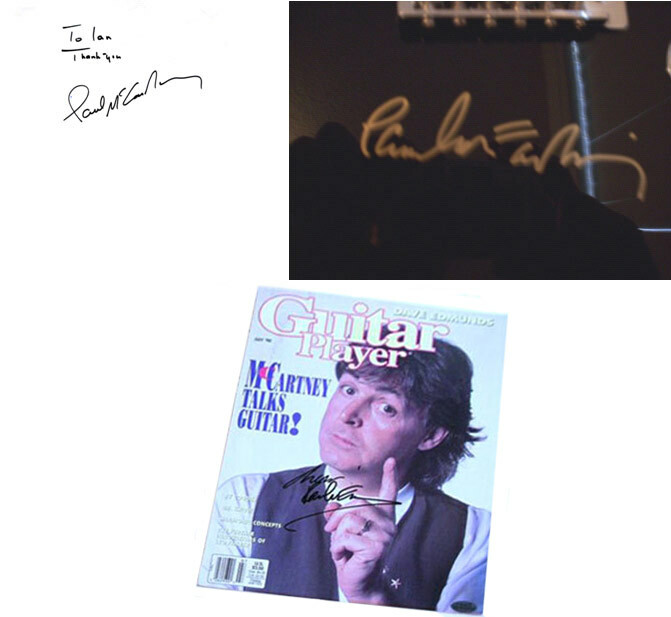 In this update I would like to show you a study I have done on Paul McCartney signatures from the early Beatles days until now. Paul McCartney, one of the greatest songwriters and in my opinion bass players ever, signature is in very high demand. He still signs quite regularly while on tour but the demand overwhelms the supply. 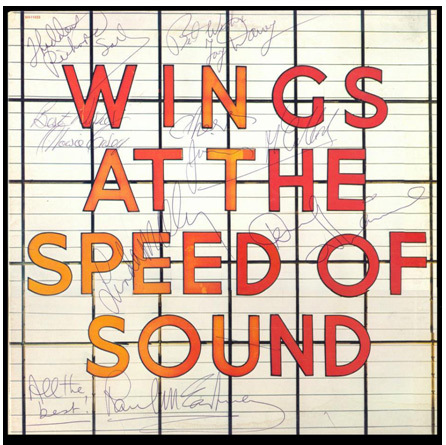 Signed Beatles albums seem to bring in the biggest dollars by far but just a scrap of paper still can fetch $500 or more. 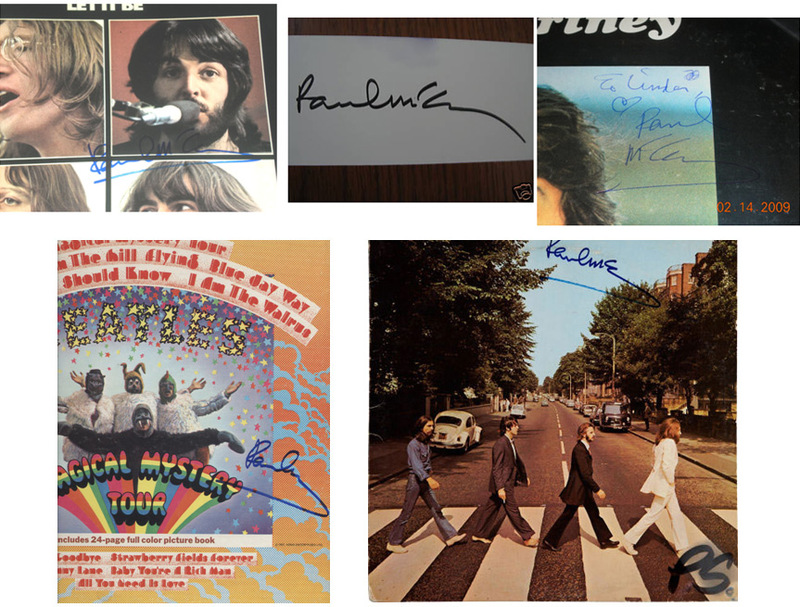 I will first start by showing you authentic examples of Paul’s Beatles era signature. Please note that Beatles era signed item do demand a premium over post Beatles signatures; sometimes as much as double the amount. Next we will jump to the 1970’s Wings era. He was still heavily guarded then but he did sign from time to time. The rest are from the 1990’s through today. Since he toured a lot there are lots of these signed items out there including books that he did at book signings and CD’s he did at signings. His signature stayed pretty consistent through this era. Sometimes he would sign a bit rushed and lately he has been known to just sign “Paul”, especially if he thinks you’re a dealer. Now that you have seen the real ones I’m going to show you some of the forgeries that go around. Some are very good and others are very easy to spot. Here is a sampling. 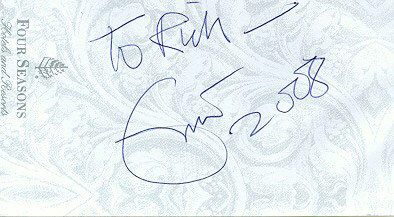 I hope this sheds a little light on the autograph of Paul McCartney. As always if you are unsure of the signature send it to an authenticator who can help you make sure it’s right. 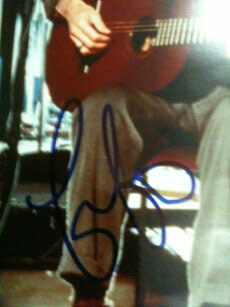 Paul’s signature is sure to increase in value as he stops touring and stops signing. But as always buy from a reputable dealer that offers a LIFETIME money back guarantee of authenticity. Cori has sent another email now stating that the autographs did not come from me but from other people. Which one is it? Please note I have never sold nor seen any of these autographs prior to Cori offering them for sale. Again this is what I have to put up with every day! Again please note who he CC'd this email to! Yet, when I asked what one or ones he wanted, his reply with the photo attached was the one he got. Your nothing but a waist of time to everything you do. You can't do anything right, your a joke in the autograph industry! You lie so much you don't even know what the truth is. You try to catch me doing something wrong, and you can't because I have nothing to hide. The stuff you say is fake came from you, the one you say is bad came from Clapton's personal manager, and the others came from Todd who got them from Mike Wheerman, who you "bow down to like a god"
The photo you got came from Todd. The photos roger calls fake came from him. I'm glad he admits that he sells fakes and for all to see. His thoughts on anything are all but NULL AND VOID! GO RAIDERS! FIGHT ON TROJANS!!!!! This is what an honest dealer has to put up with from the criminals in the autograph world! Cori Broswavic AKA Cori Raiderman crossed the line! Friend of Autograph Alert, Cori Broswavic, aka Cori Raiderman from Camby, Indiana has been harassing me for months on end. He now has proved that that he sells fake autographs and has been sued and lost in court 6 different times. He also goes by the name chefraider on EBay selling toy replica championship rings. How much longer he is on EBay remains to be seen. Autograph Alert who called him a collector and a good person knew all along of this guy’s behavior. Birds of a feather sound about right. Besides sending me hundreds of threatening emails over the course of 7 months he has now been filtrating Autograph Live, EBay and Autographalerttruth.com to spread his sickness to unsuspecting people. The emails he sent may shock some of you because of some of the false allegations made by him about me. Remember I have no idea who he is and it took me 6 months find him. Hello I would be very careful to pimp ROGER EPPERSON on your items. This man is a fraud, forger, thief, ch!ld molester, and crazy nut job. speaks for itself, and you'll see that when you go to that site. I know SRV's best friend, Jill Savage, and i'll have her look at your item for you. She lives close and helps me on ALL SRV items. This first one was an unsolicited Ebay letter he wrote to a client of mine who used my name in his advertisement of an autograph he was selling on Ebay. With roger being around so many scandles in the last yr, ( and dealing with so many known forgers in the past) Do you really want to be associated with this guy? He can't authenticate to save his life. Has been proven to be a total fool, forger, and even admitted to be a ch!ld molester. Is this really a person that your proud to be associated with? 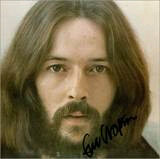 He passes albums that were re-issued and signed by people that have been dead for 16-22 yrs. Artists spell their own names wrong only on items that he sells or authenticated. It's really sad to see him fall off his high horse, just hope he does not take you with him. This email was written to a company that I recommended on this site as being a very reputable dealer. I see roger epperson is looking for you. I would trust ZERO of what he has to say. Look at the Roger Epperson tab for events with fake items he has been with! Lots of info on there and there are a few new storys that will be out soon that many feel will put him out of business all together. This new info is very damaging and dates back to the 80's. Buyer beware with anything from roger or crykin! These two beautiful emails were sent to a client of mine who wrote on Autograph Live asking for help to find a Stevie Ray Vaughan LP he always wanted. I saw your profile on Autograph Live and that your not a fan of Steve Kochel, and seem to be a supporter of Roger Epperson. Do you know of all the crap that roger has been doing? Selling fake items for 20+ yrs? Authenticating items signed by people that have been dead for 16 to 22 yrs? Artists spelling their own names wrong just on his items? Admitting to being a ch!ld molester? Pretty damaging stuff, and your a supporter of him? There were no names she said - the email address was Raiderman. Can you see why I am worried? Especially with that last claim!! This too was from a reader of Autograph Live that Mr. Broswavic decided to slander me to. I am one the most honest people in the industry and this is what these scumbags resort to, to try to keep the honest people out of the industry so the forgers can survive. Maybe now you can understand why I told him prostate cancer would be good for him. 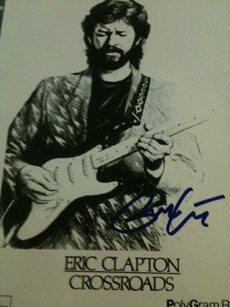 I’m now going to do a study of Eric Clapton’s signature through the years. 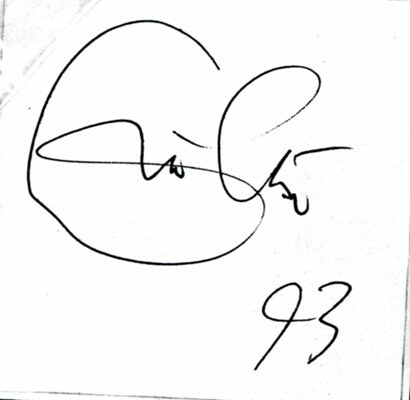 I will start by showing the fake autograph that Cori sold to a friend of mine last week. This signed photo is an obvious secretarial signed photo. The dead giveaway is in the “E” in Eric. Next are 3 poor forgeries and one more secretarial that Cori offered for sale. Can you spot the secretarial? If you guessed C as the secretarial you are correct. Notice the similarities in these 2 signatures? Now do you notice the similarities in the other 3 not authentic autographs? Neither can I! These are horrible attempts at his signature. Remember these all came from Cori Raiderman and was trying to sell them. 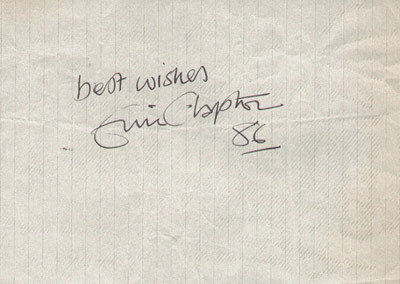 Enough on that loser let’s move on to authentic Eric Clapton autographs. I will show you his signature from the 60’s until 2009. Now from this you can see the digression of his signature over the years but you still can see the similarities that he carried on all through his career. 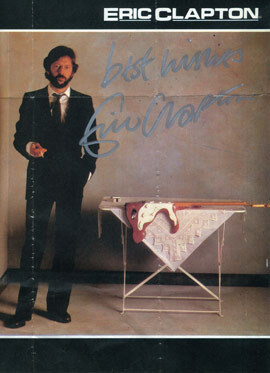 I hope this give you all a better understanding of guitar god Eric Clapton’s signatures over the years. Also if you look back at the signatures that Cori was offering you can see they are nothing like a real one.